Over three years ago, I photographed our, then, two little girls in a simple and modern way, and blew them up as engineering prints and the result took the internet by storm. The project has been shared and duplicated hundreds of thousands of times and today, I thought I’d share a little update. Because they grew up and now, there are three. I knew it was time to add Polly to the wall when I realized she was about the same age as Faye when I photographed her just over 3 years ago. In fact, it kind of could just be Polly, really. One of our readers suggested just taking a new photo of Faye and no one would even know. Ha! But! 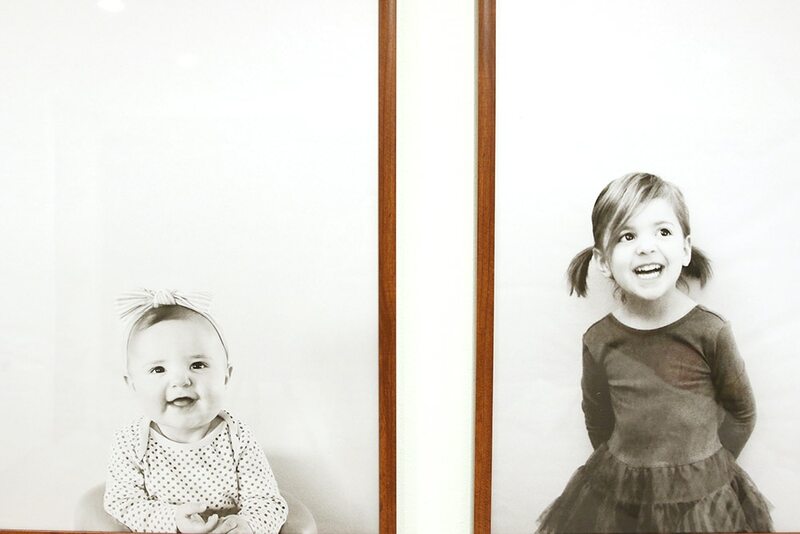 One of my favorite things about this project is portraying the age gap and scale of each child. And now that all three are up, I don’t see myself updating the photos again. How does that quote go? The best thing about photographs is they don’t change even when the people inside of them do. You can read exactly how I recommend editing the photos in the original post right here. This time around, I followed the exact same method. 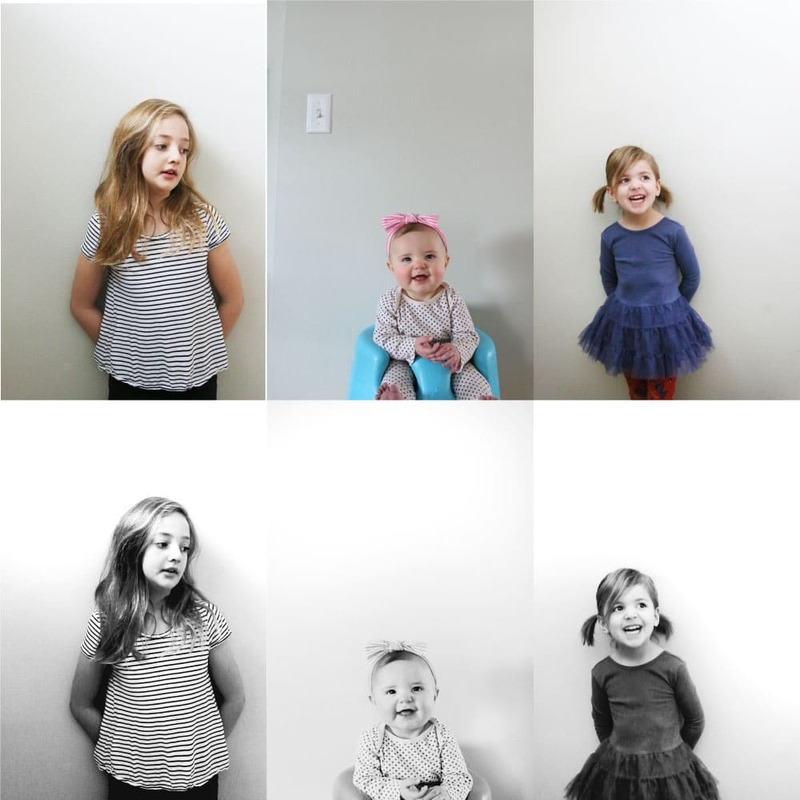 I photographed each of the girls in front of a mostly blank wall that got good lighting (in the stairwell for the older tow and in a boppy in the entry for the baby.) It’s a good idea to have someone there just carrying on a conversation with them because you’re not trying to catch them looking at the camera giving me their best cheese–you’re trying to capture their natural personalities. And after just a few minutes clicking the shutter while my mom chatted with each girl–I got it! Another update we had to make was the frame. Unfortunately, Ikea no longer sells their extra large RIBBA frame in the Walnut color, so I went on the hunt for a similar 24×36 frame with a wood look to it, for cheap. I found a pretty great dupe on Amazon! 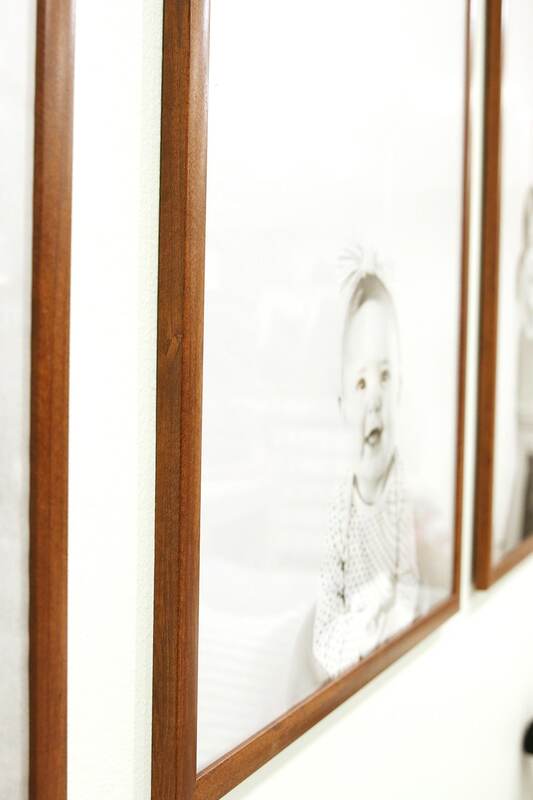 These walnut veneer frames are 24×36 and just over $20 a pop! I bought the 4 pack and they arrived quickly. The quality is about on par with Ikea. The acrylic fronts were protected on both sides and it came with the hanging hardware, too. The color is a little more red than the previous frames, but the finish is smooth. The last update I have on the project is where you can get engineer prints printed. We print ours through a regional print shop, Alphagraphics, (they dot the map in Utah/Idaho/Wyoming) where I printed all three for less than $8 total. I also checked with Office Depot and Staples, since that is where most of you mentioned you would get yours printed. Office Depot basically said it varies from location to location, but to contact your local Copy and Printer center because they would be able to tell you. Staples said they do it. The information is in the chat below. 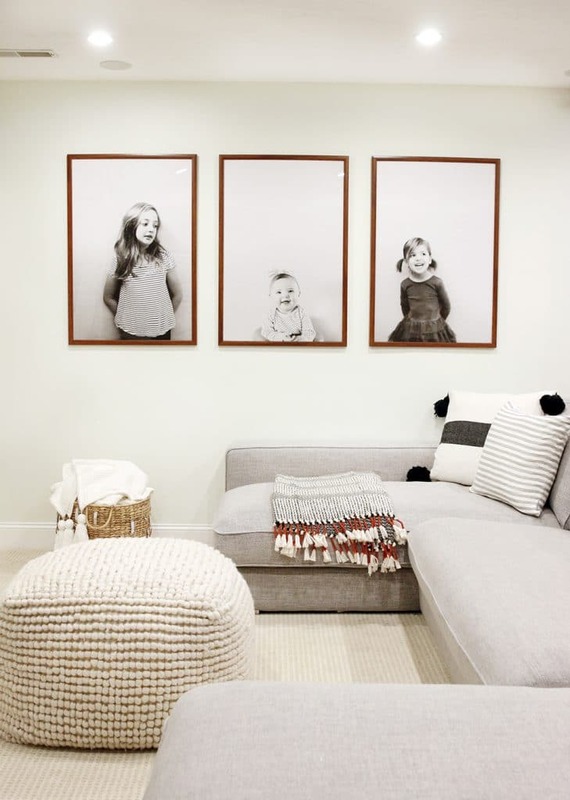 The girls love seeing their cute faces, larger than life, in our family room/playroom and my heart, of course, melts every time I walk in there now, too. Don’t forget to check out the original post here, for more editing tips and if you have tried this project, we’d love to see! Tag us on Instagram with the hashtag #cljengineerprint and we’ll repost a few favorites! How to Make an Indoor Swing! 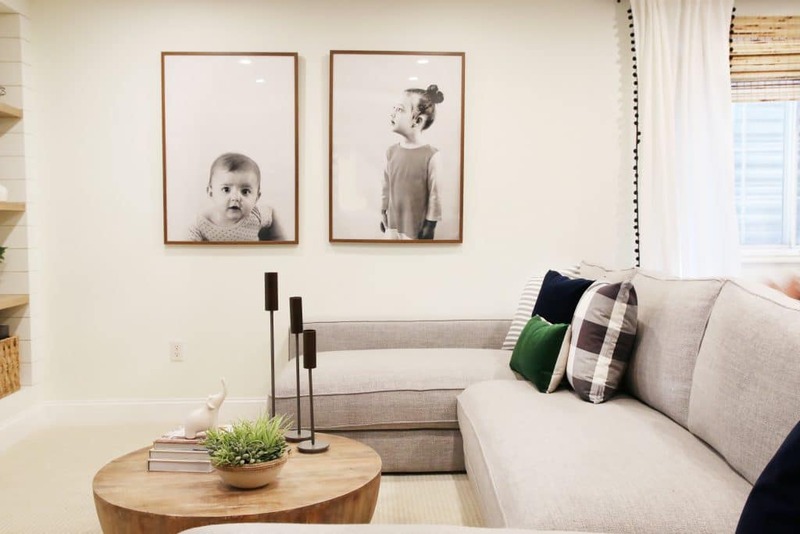 The Reveal: Family Room Before and Afters. Do your prints go all the way to the frame edges because mine aren’t. What do I do? There is about 1 inch of space running down the length of the picture before the frame. I just printed poster sized engineer prints at Alphagraphics in Lehi, Utah. They were awesome, didn’t ask any questions regarding my “photos” and they were only $7.50 total for two prints! My images also had waaaaaay more ink than the pictures in this post. I asked if they would do it in color and they said yes for double the price. Still super cheap. Can I ask where you got this couch? As of December 2018 I have had both Staples and Office Depot refuse and cancel my order for Engineering Prints claiming they MUST be printed as Photos/Posters (at $25+ versus $6 of course). Just an FYI. According to Staples (Stacey was super helpful) they have recently updated their policies to no longer print “saturated inks” to engineering prints (bw or color). Just an update. I’m in Ohio. Your mileage may vary! Would you share paint color on your walls? Print supervisor at an office supply retailer here. These are in no way, shape or form a blueprint. These are posters and customers will be charged the poster pricing. With us this starts at $19.99. It doesn’t matter if it’s in black and white or color, or even what kind of paper it’s printed on – it doesn’t change the fact that full size photos like this are NOT blueprints/engineer prints in any way. Stop misleading people. Your comment is rude. As for the up charge it has nothing to do with cost and everything to do with these places not getting 5x the markup by calling it a “poster.” I had a project that needed the print to be on the thinner paper. I literally could not get that done? It’s ridiculous that they changed their policies based on the popularity of these projects. Printing is printing. Since when is price based on content? 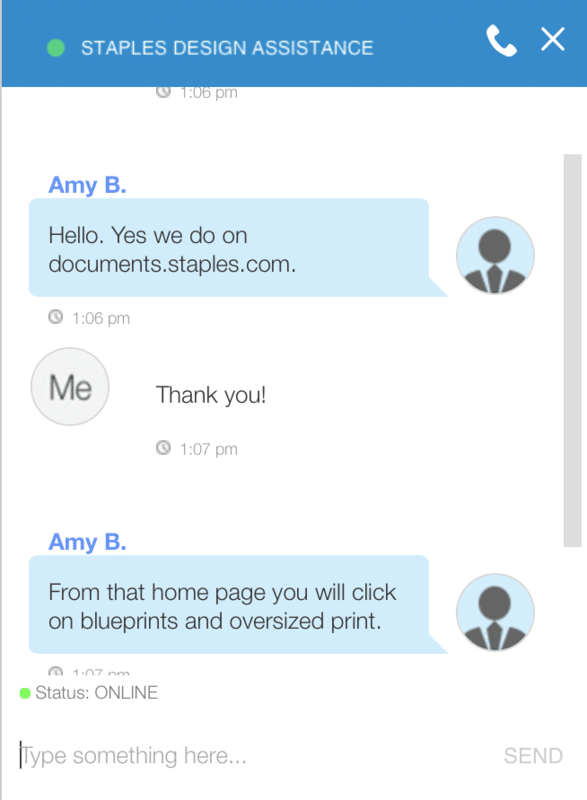 Staples no longer will print images as an engineer print. Any other thoughts on where to get there printed? There’s lots of great suggestions in the comments. They do make non-glare plexiglass, you could pop in! Do they not come with wire anymore? These are pretty old. Love this idea! I’m trying to recreate for Father’s Day and I went to my local Alphagraphics in Austin who quoted me $150 for 2 24×36 prints! I asked about the price discrepancy and he said each store is individually owned and are able to create their own prices… $150 for 2!??? I’m so bummed after taking the time to take pictures, edit, etc. My gosh! I work at Alphagraphics Walnut Creek, CA and we charge $10 a print on a 24lb. bond paper, Blueprints are on 20lb. I cannot imagine what paper they may be using. I could make them and sip them for a lot less. You may want to go to http://www.alphagraphics,com to find another location nearby. It is because they are not blueprints! The ink saturation is huge on the PHOTOGRAPGHS! You have probably had and answered this question a million times but hey, I’m new here so maybe you’ll forgive me. :) How do you like your Interior Define couch? Thanks so much!! I love these and have since duplicated for our living room! They turned out so great!! Thanks for sharing this amazing idea! When I click on the link for the frames it says it’s $82 with $14 shipping, a lot different than the stated $20. Amazon can change their prices at anytime, but I believe it’s $82 for 4. Would you be willing to share the source of the tassel pillow? Got it from Shop The Mine! I have duplicated your project (Thank you for posting!!) and ordered the exact frames however I’m having issues with my paper not laying flat/flush inside them. It looks as if the paper is wrinkled or wavy. Did you have this issue as well? If so, how did you remedy? 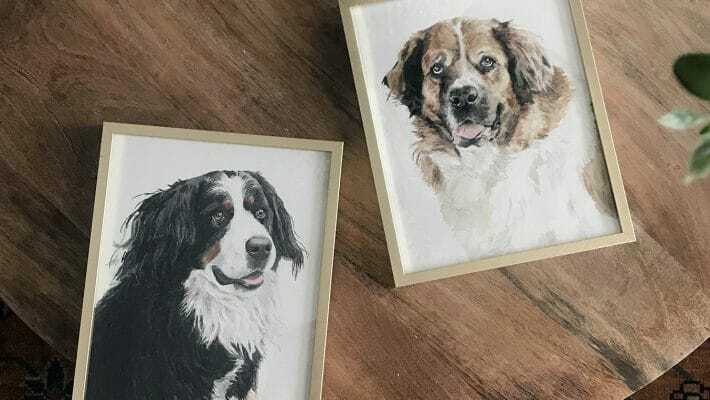 Make sure the paper is a little smaller than the frame and another tip is if you need a little clear scotch tape to keep it stay straight–that works well, too! I think it’s the dove gray? Basketweave. Hi! I see that it was addressed in your comments, but I wanted to point out that that chat screenshots are a little misleading. Staples cannot print photos as engineering prints. It even says on the website that bond paper/engineering/blueprints are not suitable for color. The paper is too thin and the ink doesn’t absorb into the paper. It floods back into the machine and damages it. Engineering prints need to be less than 30% ink coverage, meaning 70% needs to be white space. It has nothing to with the quality (graininess) of the print or about wanting to up the price. It’s about not damaging our machines. There are other inexpensive paper options. Just ask an associate. So please consider this when placing your orders, and especially when getting hostile with someone who works at a shop. This also goes for Office Depot. Those machines cost upwards of $3k each and printing a highly saturated photo on thin engineering paper could destroy the print heads. This is why we will either charge you extra to print on the lowest quality poster paper or we will cancel your order. We understand that you are on a budget but office Depot often runs sales on our large format posters! Just keep a look out on the website under deals and coupons. Where is your couch from? This is the Ainsley from Interior Define. I absolutely adore the updated photos! They all have such personality, and the composition with the three of them is so dynamic. I love that the frame is a warm brown with these prints. Perfection! Can you share what settings you had on your camera so that the pictures don’t look really pixelated or grainy when blown up that large? Hi! I LOVE this project! Thank you for sharing. I actually have an Alphagraphics around the corner from me. Just to clarify, when you had them printed there, did you actually call them “Engineering Prints”? Just want to make sure I get my terminology right before I send mine to print! Thank you! Uuh, please tell me more about that pouf! 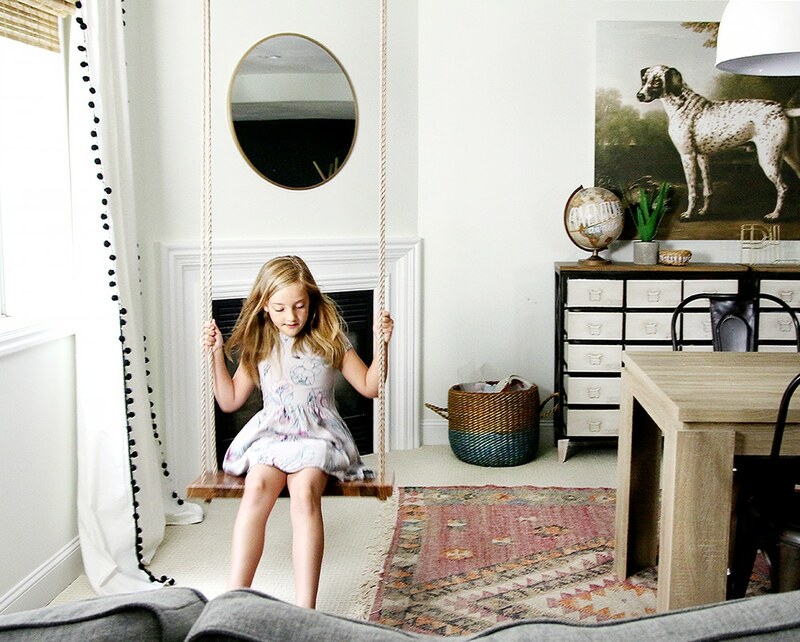 I totally ordered the coffee table when you recently posted the sale but ended up cancelling my order since they are so backordered and after giving it more thought, my kids will probably be safer for now running and jumping near a pouf rather than a hard table. I see its on sale now for $279…should I snag it? we love it!! It’s substantial and comfortable. If I printed a photo in color, would it still look good with the engineer print? Thank you! I think that’s totally personal preference. Hi, I followed CLJ’s recommendations on how to resize photos for engineer printing and I did both B&W as well as color and they both came out looking amazing. Not grainy or anything! I did mine at Staples. Hope that helps! Hi! I love the pictures and will definitely try this! Just a question about your couch, we also have an interior define couch and wondering how you maintain it. Mine is over a year old and feel like it is hard to maintain the shape of the cushions. Any tips would help! I probably fluff the cushions once a week? I’ve done engineer prints multiple times and my print shops are SO all over the place about it. Office Max/Depot (They merged and I can not remember which name won.) refuses to do ANYTHING but straight text. No shading, etc. Staples (again, the one by me) used to do them in color, and won’t anymore. Also, they won’t do anything “that takes significant amount of ink”, whatever that it. Everytime I send one in now I have to go round and round with them. It really isn’t worth it anymore. They accept the order online and then the store calls and fights it. I hope it is just my local shops and others are having an easier time! I do love an engineer print! Actual engineer prints usually consist of lines, outlining structures. Printing pictures means large areas of gray to black, which uses up considerably more ink even on pictures like Julia’s with lots of white space, so even those might be considered using “a significant amount” of ink. The more dark areas a print hat, the more likely that is to be so. Since the price of the print is calculated with the averaged normal production cost in mind, and the ink being the most expensive part of that calculation, I can see how stores would eventually balk at people wanting large-scale photo prints. Especially if it’s not a random customer once a year anymore, but the popularity of this and similar projects bringing in frequent requests of this kind. Your birthday posters sound really fun, but probably were running to about 80-90% ink coverage where a true engineer print may have 4-5% or so. I wouldn’t be surprised if eventually, many places create a separate pricing and category for the photo-engineer prints or other posters, to not flat-out deny the request but to also make sure they don’t take a loss on them. My neighborhood Staples will not print regular pictures as engineer prints anymore either. But I did find Parabo Press on line and in app form. They do color and BW engineer prints and ship to your house. The price is much higher but I think that is due to the amount of ink needed as others have mentioned. I’ve been really happy with their product. Hi Ladies, as I mentioned, I own two blueprint (reprographics) shops in So Cal. The only thing I would point out to a client who sends in these kind of “pictures” to be printed on a blueprint machine indeed would be the grayscale and shading. As Judith noted, yes – those machines are designed to print lines. Sometimes the machine won’t print those large gray areas with consistent toner coverage – there could be (white/unprinted) lines running through it. We have other machines that are designed to print high-res, high-quality color prints on a variety of media (including photo paper), but you’re in a much different price arena. We have an artist who uses our print shop for her large-scale murals (she paints over the prints), which is so cool considering 99.9% of our day is spent looking at construction plans. We had several back-and-forth rounds with her on this very topic (machines are not meant for large areas of toner coverage), but I gave her some tricks to edit the files in photoshop and we actually adjust settings on the printer (only for her! she notes it on every order; we’d go crazy if every client had this sort of request…ha!). What is the name of your shop so I can come there? Hi Karen! I am very interested in using your shop. Would you mind posting your shop name? Or feel free to email me at elizabeth_hahn17@hotmail.com. Thank you Chris and Julia for this awesome idea!!! I LOVE this! So simple and effective. Can you tell me the difference between getting an engineer print and a photo print? When I did it on the Staples website the engineer print lookes like it will be so grainy. Is it just for $$$ difference you went with engineer? Thanks! We have ours printed through Alphagraphics. Engineer prints are characteristically more grainy, though. A+ as usual. What do you think of acrylic instead of glass for frames? I bought a pricey 11×14 frame from Restoration Hardware and was surprised it came with acrylic. I ended up getting a sheet of glass cut because I couldn’t stand that the reflection was curved. Curious as to what you think. Yikes! If I was paying big money for a frame, I’d expect glass. Although for large frames, it’s almost always acrylic for safety reasons. I’m actually pretty impressed with this acrylic. If it’s thick enough, it won’t curve as much or even not at all. The thinner (aka cheaper for the seller) it gets, the more curves happen. Especially with the larger scale where gravity noticeably makes the weight of the sheet pull on itself, too. Also, of course, if you choose glass then there are more options for anti-reflection coatings which can make a massive difference depending on where the end result will be hung. I love the prints! The room feels complete with 3 :). Can you tell me where the black and white pillow is from? Just wondering which option I pick on staples once I get to Blueprints and Oversized Prints? There is Oversized color prints (i want black and white), B&W prints…but it says not suitable for photos, Color blueprints which also says not suitable for photos, and the last option is presentation graphics. I love this and can’t wait to do Please let me know what option to pick ASAP. I’ve never used Staples for printing, but I’m sure they are saying it’s not suitable for photos because engineer prints have a grain to them. They aren’t super crisp, but that’s the charm. Thank you so much. I just love these!!!! I tried doing an engineer print for a quote and had an issue with the paper looking wavy inside the frame. It was a good quality frame I was using. Any recommendations for that issue? As soon as I took off the plastic protecting the acrylic, I laid the paper in place and the static helped straighten it out. Also, if your picture is just barely smaller than the frame–that helps! I just love this project – it’s been on my mental to do list for a while, I just haven’t figured out the perfect spot to hang them! The updated photos are precious! I actually love the redder wood even more than the original frames! They looks awesome! Also – Greta’s hair is basically what I strive for every time I pull out my blow dryer/curling iron/handful of styling products. So basically… good job Greta. Perfect EFFORTLESS beachy waves! ha! If you use a good camera, you should be fine pixel-wise. You can even make it a 24×36 in preview! Our cape cod home has very limited wall space so I took our three children newborn photo (5×7) that the hospital took and matted them . Our two grandchildren enjoy pointing out their “mommy”, aunt and uncle when they visit. Since our oldest is 30 now, it allows me to have a photo without having to decide which is “the one”. (I use to have way too many photos out-just gave goodwill over 20 frames-some have clutter, I have photos) Slowly clearing surfaces and walls has surprisingly felt wonderful. Who knew. I adore your updated trio of enlarged photos! 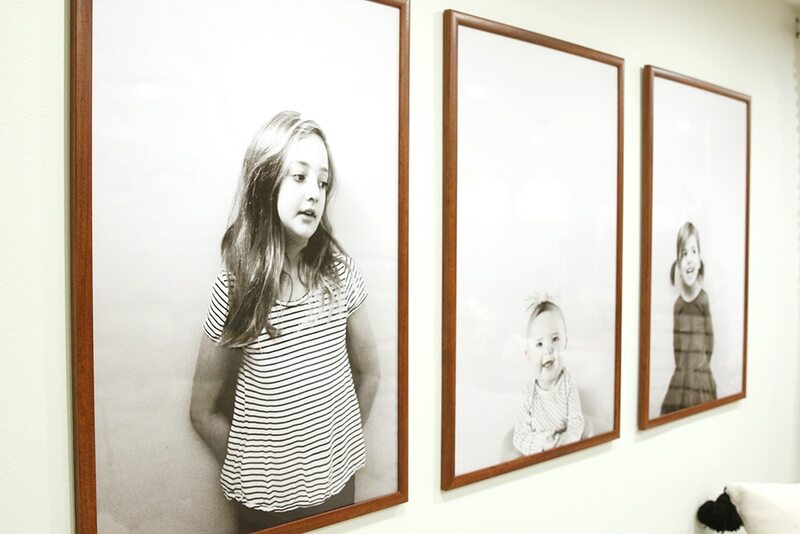 I tried to recreate this project with pictures of my two little boys, but the prints I received were entirely too light, to the point you couldn’t identify the features on their faces. I was so discouraged because I am obsessed with your results. Love these updated engineer prints! I wish IKEA would bring back the Ribba in the walnut color. Why did they ever take it away? :( The new frames are nice too, but a bit too much red in it. I think 3 look better in this space than 2. 3. It’s a magic number. Support SMALL, (and most likely) FAMILY businesses by finding a “reprographics” (aka blueprint) shop! We print these ALL DAY long, Monday – Friday at our shops for arch/eng/GC/etc, it’s our primary service. In my area (SoCal), the “big stores” are $5/24×36 sheet; my shop is $1.26. Since note to Anna, we also print full-color in large format; not as cost-effective as b&w, but our shop def prints color and b&w large format. Karen please tell me where your shop is. I will use you since we are socal too. Is the acrylic facing nice and flat with these frames? I’ve always been annoyed that the acrylic is ripple-y and cheap looking with similar sized frames I bought at Michael’s :(. I’ve been keeping my prints in the Michael’s frames until I could swing for better frames, assuming I’d have to go expensive. If these are better looking, I should make the jump sooner than later! I was actually pretty impressed with this acrylic. Oooo I think it looks absolutely amazing! Love it! A quick FYI from my experience in trying to get some prints like this done for a party – the copy & print manager at Staples did tell me that black and white is the only way they can do these (apparently color prints gum up the large-format printer). Love the new photos of your girls!